Back and forth. The rhythm of conversations surrounding global warming have us looking from one side back to another. The world comes together to make an agreement in Paris to globally lower emissions, and then not long after, the United States states its intentions to back out. One moment climate change is real, and the next the opposite claim is made. Back and forth. And the result is dizzying. In the midst of the global warming debate haze, however, clarity comes from the steadying, clear voices of college and university leaders, state and local governments and environmentally-minded businesses, who have not wavered on the commitment to climate change action. University Climate Change Coalition (UC3) research universities working with local governments, businesses and communities in climate action. Their action is in response to the world’s scientists who continue to beat the climate drum they have been pounding for decades. Recently, a United Nations-led scientific panel tasked with creating a broad and detailed review on the status of climate change, released a report evaluating the impact of 1.5°C of global warming, summarized well in this interactive graphic from CarbonBrief. To me, what was even more striking about this report was the reminders about the relative impacts between 1.5°C and 2.0°C changes in global temperatures. While that 0.5°C may seem like a small change, it has huge societal implications. Here in the northeast, we will have double the time of our warm spells, double the number of heat-related deaths, and roughly three times the number of extreme heat events. Internationally, we will see nonlinear increases in food shortages, severe hurricanes, wildfires, rising sea levels and deterioration of coral reefs. Do we feel hopeless when we read these sobering future trends, or do we feel motivated? Are those two options mutually exclusive? When faced with our own limitations, there can be a tendency to create either/or scenarios. When we can meet our goal, we check the box. When we can’t, we delete the file. Our responsive actions seem only to be black and white. Digital. One or Zero. So how do we respond when precedent is what holds us back and the range of possible actions aren’t simply a yes or a no? Are we drawn to the comfort of routine and resignation? Or – to paraphrase my favorite quote from Buckminster Fuller – can we come together to build new models that make the existing ones obsolete? Breaking precedent requires we think and act in fundamentally different ways. 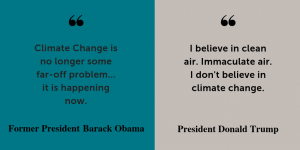 This was the catalyst behind the Presidents’ Climate Leadership Commitments a decade ago. This is the driving theory behind rethinking the role of the university in place-based climate action in the University Climate Change Coalition (UC3). And as the manager of the Climate Leadership Network, we remain committed to building new models to accelerate climate action in, and through, higher education. The Valley Performing Arts Center is a LEED Gold sustainably accredited building at California State University, Northridge, with reflective roof surfaces, energy saving lights, and tinted glass windows. Photo credit: Valley Performing Arts Center. One way is for these new models to be tested within the higher education sector as both a use case and as a learning tool for our future leaders. Take carbon pricing. This is a topic that is widely discussed and different policies are being implemented and evaluated at the state and regional levels. So what we wanted to do was to work with campuses who had created an internal price on carbon to share their experience, develop a community of practice around the considerations for carbon pricing, which then raises awareness about the policy discussions. You can learn more about this effort in our carbon pricing toolkit, which we recently launched this past month in partnership with the Carbon Pricing Leadership Coalition and a working group of partner institutions, including Yale, Smith College, Swarthmore College, and Arizona State University. Sample energy dashboard for University College London, used to show emissions data to departments. Included in Carbon Pricing Toolkit. The urgency to act is once again thrust into our consciousness by a consensus of the world’s scientists. Our collective response can only meet the scale of challenge if we are willing to work differently together. The next year ahead will be critical if we are to break through our preconceived ideas about what is limiting our action and be willing to shape new precedents for a future that we didn’t think was possible.